If you've just decided to learn to drive or to begin learning again, no doubt you will have a number of questions that need to be answered before you can decide which driving school to employ. Listed below are some of the more frequent questions that we are asked and while some of them are fairly obvious and will already have crossed your mind, the others are equally as relevant and most certainly demand an answer. Q : How much do you charge? A : Unlike a number of other driving schools who charge a higher rate for those times of day when you are most likely to want a driving lesson - evenings and weekends - we have a standard rate for all lessons. We also offer generous discounts if you buy a block and details of these savings can be found by contacting our office. Q : How many lessons will I need? A : Of course it's difficult to say as abilities vary widely, but reports have indicated that a pupil requires, on average, between one and a half and two hours' tuition for every year of age. Bad news perhaps of you're 85 years old and such generalisations are often a poor guide, so at College School of Motoring we suggest a pre-course driving lesson to enable your instructor to assess your potential, and it also gives you an opportunity to assess us! Q : I understand that you give 50-minute driving lessons. Why is this when so many other schools give one hour lessons? A : Most of our pupils actually take double lessons (100 minutes) as experience has shown us that very often 60 minutes is too short and 120 minutes too long. Better to have a lesson duration that enables you to learn something new each session and yet does not you feeling exhausted by the end of it. Q : That sounds logical enough but I have neither the time nor the money for an 100-minute lesson. Will you not give me an hour? A : Certainly we will. Some of our pupils do have one-hour lessons. Some indeed have two-hour lessons. We are very flexible and will happily fit in as best we can with the specific requirements of each and every pupil. Q : Do I need to meet you at your office or can you come to me? A: We offer a free pick-up service from school, work or home within a reasonable distance of our office. This means that often we can meet you at school and you can drive yourself home! Q : My brother has just passed his test. Can he teach me to drive? A : No. A learner driver may only be accompanied by a person who has held a full licence for over three years and is at least 21 years of age. If your brother does fulfil these criteria then his insurance company must be informed of your intentions. Q : If I fail my test, do I get my money back? A : Fail your test? How do you mean? Seriously though, you're not the first person to ask this question. Regrettably the answer is no. College School of Motoring prides itself on it's excellent pass rate, a rate that is sometimes almost double the national average. The question of whether one gets one's money back is rarely an issue. Q : Which cars do you teach in? A : We have a variety of vehicles that we teach in, and this very much depends on where a pupil lives and therefore which instructor is employed. 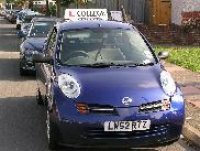 All of our cars are insured for the purpose of driving tuition and are fully equipped with dual controls for extra safety whilst learning. For you and for the instructor! Q : Your prices seem to offer good value, but there's a man in our road giving tuition for only £18.00 an hour. Why shouldn't I use him? A : We are all constantly inundated with offers that seem surprisingly cheap, but what do you actually get for your money? You may not be aware that driving instructors must pass three rigorous examinations before they qualify to teach for financial reward. These exams include a hazard perception and theory test, a driving test where an exceptionally high level of skill is required, and finally, a test of their ability to teach. Only then can they refer to themselves as an Approved Driving Instructor (ADI). Having qualified they are then regularly check-tested to ensure that the high standards they displayed on qualification are being maintained. Any offer of cheap driving tuition should be treated with caution. It is possible that the instructor is not an ADI or perhaps more worryingly does not believe that his tuition is worth more than 15.00 per hour. Are you sure he's the right person to be teaching YOU? At College School of Motoring, all of our instructors have been approved by the Department of Transport and we believe that we offer an excellent standard of tuition at an affordable price - i.e. VALUE FOR MONEY. Q : Great. When can I start?